Jim has in-depth technological skills, serving multiple organizations in both public and private sectors. Intrigued by aerospace technology, and after receiving a Top-Secret clearance, Jim served as a Senior Systems Programmer at the Central Intelligence Agency in Washington, DC. Over a period of six years he developed and implemented numerous mainframe Operating Systems modules, and programmed routines for the agency's Surveillance Satellites. His strong Information Technology knowledge, coupled with his business communication skills in developing policy and procedure standards, led to his selection as the Executive Assistant to the Deputy Director of Science and Technology at the CIA. While in the private sector, Jim served as a Senior Recruiter and consultant with General Electric Consulting Services where he was responsible for recruiting over 1,000 IT personnel from Helpdesk technicians, programmers, Web developers to Database Administrators and CIOs. Previously he served as VP, Director of Systems at PNC Bank and Humana Corporation. Jim returned to Washington, DC to join the National Center for Missing and Exploited Children where he served as Vice President of Administration, IT for all U.S. branch offices (CA, FL, MO, NY, TX, SC). 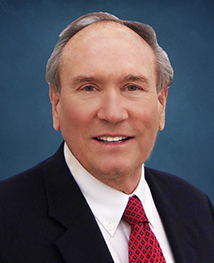 He was later assigned as the Center’s Executive Liaison to a large database corporation in Florida, working with a team of specialists and representatives from government and both U.S. and international law enforcement agencies dedicated to the identification and apprehension of those involved in the exploitation of children. Jim's undergraduate degree was at the University of Louisville in both Mathematics and Physics. He holds two advanced graduate degrees from Purdue University (school of the astronauts), Master of Science in Computer Science and Master of Business Administration. Jim and his wife Bettye live in Boca Raton, FL and spend summers in Louisville, KY. They enjoy spending time pursuing their passion for travel.